First time I ever had a crepe, it was filled with Nutella. From there, my addiction to crepes was founded. I would search out crepe stands for savory and dessert crepes all the time. There is a perfectly good reason (I thought) for not making my own: 1) They are supposed to be hard to make, 2) It requires a special pan. MMM..Well, today, I learned that they are very easy to make and that they do NOT require a special pan. So, there is absolutely no reason, why I cannot have my favorite treat, whenever I want! HOORAY!!! 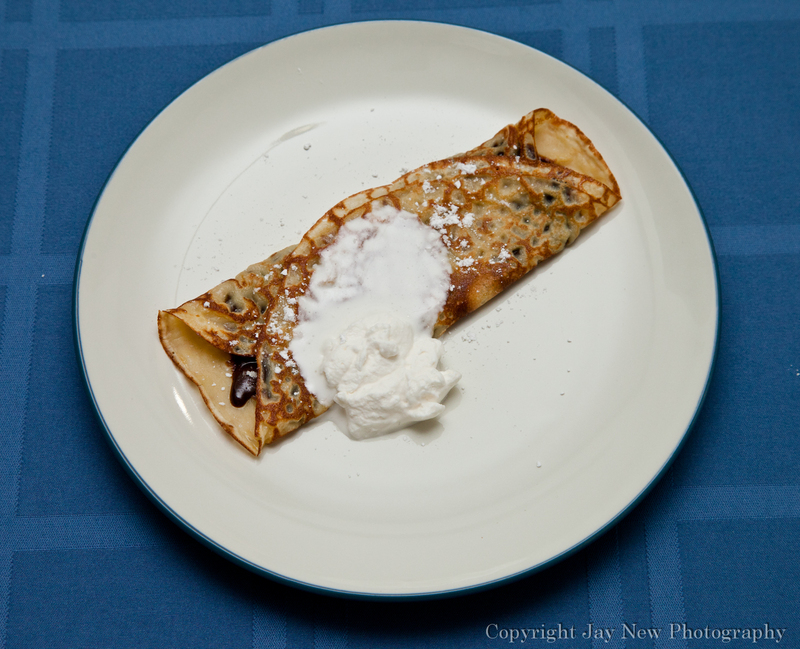 I was on Foodpress the other day and one of the highlighted recipes was for Crepes. 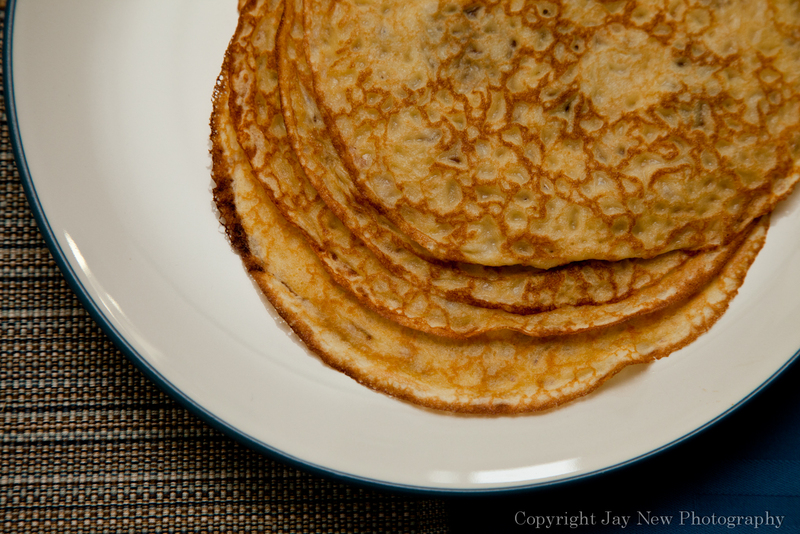 So, I quickly asked my husband “Hey, would you like crepes for breakfast tomorrow?” He said “Sure.” (I love how he has the confidence in me, that if I say I am going to make something, I will make it. So, I quickly went to my kitchen, threw the ingredients in a blender and placed the batter in my fridge. This morning, my adventure began. I re-blended the batter, turned on my oven to 200F and placed a large plate inside. I then took a very good non-stick frying pan (8 inch) and sprayed it with cooking spray heated it to medium heat. Finally I poured about 1/3 cup of batter in my pan and proceeded to HESITANTLY swirl the batter in a circle. After flipping it over and placing the cooked oddly shaped crepe in the oven, I went over what I did. Well, easy enough, my only problem was not having confidence in myself. My Final Crepe Video Attempt. It came out perfectly! I want to thank Janae Monir, for her excellent post and recipe. I used her recipe Jane Monir’s Recipe for Crepes and used 1 tablespoon of Disaronno. 1) Chill your bowl and whisk and make sure all your ingredients are cold before starting. I used my kitchenaid, so I chilled the bowl and whisk. 2) Add all ingredients to your bowl and mix until stiff peaks are formed. 3) Adjust for sugar and repeat whisking. If chocolate is not smooth, microwave addition 15 seconds and stir. Thank you so much for your kind words! I am so happy I tried making these. Now that I have, I have so many recipes I want to use them for! Thank you for visiting and Happy Cooking! Thanks! I am really excited that my first try was successful. I can’t wait to make more! oh yum yum um! I am craving crepes with nutella and strawberry, but since that is out of season, bananas will do! mmm..I had mine with bananas and chocolate this morning. I was in heaven! Thanks for visiting! PS ~ It it’s funny you used Disaronno, because I used that in my dessert crepes too! LOL Nice! Great minds and all 🙂 I think I need to stock my freezer with crepes now. I absolutely LOVE savory crepes. I think my husband has only ever has dessert ones. He was thrilled when I told him there was Disaronno in the ones I made today. What beautiful crepes! You did a fantastic job on your video (I like your flipping skills)!!! Thank you so much! 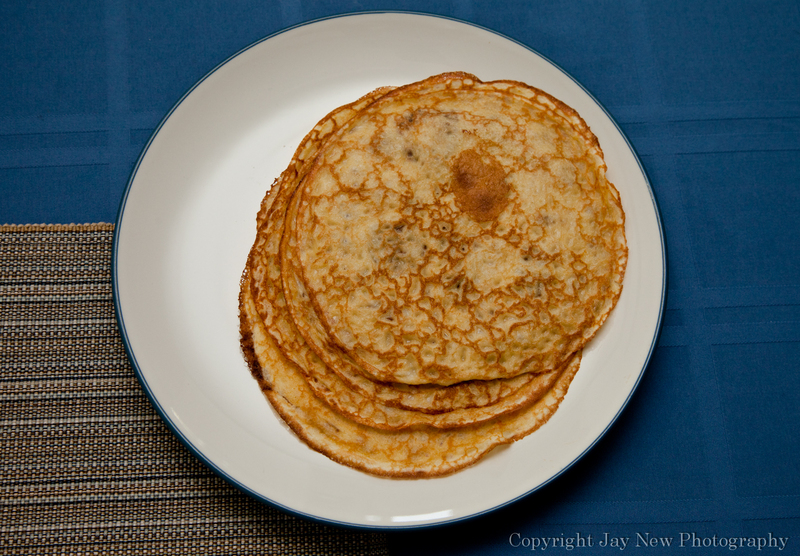 Your blog helped me get over my “oh crepes are hard” thought in my head. I have been working on getting rid of those “it is too hard to make” thoughts on dishes like these and in doing so, I have opened myself up to a whole new world of recipes! Thank you for posting your recipe!